I am going to cover this test project in a short series of articles. Below are some photos of the test hardware we will be using. As the title implies, we are going to run two separate tests, and share the data. I am going to put the results on You Tube also, because I want builders to see the results in action. The Compression test will be done first, it is fairly straight forward. I am building the engine, giving it a break in run, and then checking the differential compression, and running a base line full power run and noting the full RPM the engine makes. I am equipping one head on the engine with small threaded ports next to spark plugs. For the base line run, these will be sealed. For the second test, I am going to open them up so the engine differential compression tests near zero 0/80) on those cylinders, and run the engine again and check the full RPM in comparison to the base line. There is a widely held, but mistaken belief, even among aircraft owners and mechanics, that a cylinder with a differential compression of 40/80 makes half power, and one with 0/80 makes none. Neither of these are remotely true. The differential compression just measures flow against a known orifice, and does not correlate to any percentage of power out put. If the myth were true, the test engine with the three ports open would make less than 50% power output, but as we will see, it will do far better than that. From professional dyno testing done by Dan Weseman and myself last year, we will be able to put HP numbers on the test stand RPM outputs, and the comparison will be enlightening to many people. The engine will actually appear to run better at idle. It will not detonate at modest power output. When the throttle is advanced to full power, it will run normally for a few seconds, and when it reaches ‘kindling temperature’ it will suddenly begin to loose power. This power loss will be far in excess of the engine running with 3 cylinders with zero differential compression. If the throttle is not retarded, the power will continue to drop, to well below the level required for flight. We are working to get the engine instrumented with recording CHT’s and EGT’s for the detonation tests. These will show a very sudden spike in CHT’s and a decrease in EGT’s, as all the BTU’s in the engine are destructively going into the heads. I will be working to capture this on video, so everyone can study the effect, know it when they feel it in their plane, and abort their test or take off. Again, a person with a correctly built engine and set timing will not experience detonation, but over the years, I have had a shockingly high percentage of people refuse to set their timing with a light, and I have people who never took advantage of my 39 free colleges to learn it directly from me. The last part of the tests will be a disassembly of the engine, after it has been detonated to the point where it would no longer make enough power to sustain flight, to show the internal damage done. Because we teach people to use forged pistons in Corvair motors, and because the head studs in the engine are 9″ long instead of 1″ like a Lycoming or Continental, the visual results will be different. I will carefully document the changes on the engine as a reference for people inspecting engines. The engine in the tests will not have a fifth bearing, nor will it have new seats and guides, and afterword, I will salvage some items like the prop hub and starter, but these test will still be expensive, costing several thousand dollars and perhaps two weeks of labor. I am conducting them so builders will have a chance to learn something. It this happens the time and the money will have been well worth it. Test engine, 2,700cc’s. This bottom end came out of one of the two core motors we found. The plastic orange plug set is a kit sold by SPA/Panther specifically for Corvair storage and painting. Note, old style bell housing cover in place of 5th bearing. This engine isn’t going flying, and the tests are all taking place in the combustion chambers. Heads getting reworked at SPA/Panther in advance of the tests. Travis Young (aka “Retro Black”) took care of the machining operations. Their machine shop is set up for both engine and airframe parts production. 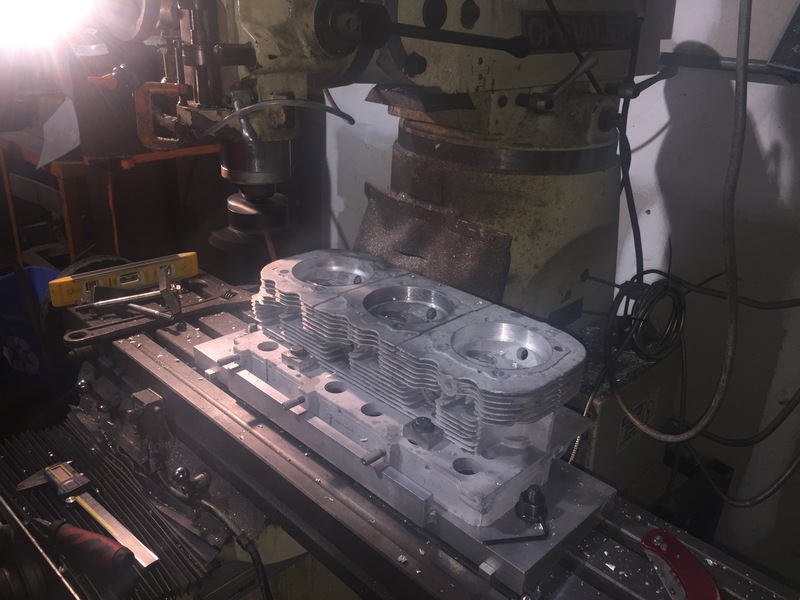 The heads are getting perfect head gasket machined surfaces, and welded on intakes, but the valve job and the guides are just street car level work. Again, the motor will run for less than one hour, it doesn’t need new guides. Engine getting decked in the mill. These surfaces are now perfectly true and flat. After severe detonation, warping in the heads can often be measured directly with a straight edge. The head gasket areas are often impressed into the heads, and the lower row of studs can become misaligned. Detonation puts a tremendous amount of heat into the heads, enough that they will plastically deform. Most people think of detonation putting holes in pistons, but it only does that on cast pistons. On forged Corvair pistons, the damage is more subtle, the oil control rings become stuck in the grooves. I intentionally specified forged pistons because the engine will actually tolerate a lot of abuse with them. They are a margin of safety on small mistakes, but they will not provide immunity for fools. Head bolted to a fixture plate in the Mill. The unit is a very nice Chevalier with DRO. It is in good shape, having lived in a tool room most of it’s service life. Next time you See Dan at a College or an Airshow, you can get him to share the story of how he bought this piece of equipment for $6. In two weeks we will be headed back to Oshkosh. Once there we will be surrounded by hundreds of companies that will all attest on a stack of Bibles that they have carefully tested all of their products to protect the safety of their customers. In with these people will be at least 30 companies selling engines. Every single one of these companies will tell you without blinking an eye that their engine power output numbers are the result of careful Dynomometer testing. Almost all (90%) of these companies are lying about this. Traditional dyno testing is expensive, and a bit of a production to adapt an aircraft engine to. To learn much, it requires hours of evaluation, and runs at different conditions. Any company that does this would be justified in taking a photo of this milestone in their company history…….except you can politely ask to see a photo of their engine on a dyno, and of course they will not be able to produce a single image of their engine running on a dyno. I actually had one company tell they had done 100 hours of testing, but had forgotten to take a single photo of it. In an era where nearly every human has a cell phone that is also a camera, please tell me who would believe this? I didn’t invent this kind of dyno, it has been around a long time, pictures of them in 1960s Sport Aviation magazines. This isn’t even the simplest kind of dyno. In one old Sport Aviation there is a picture of a Corvair hanging on a steel cable turning a prop, with a wooden arm touching a scale. Yes that works also. The pictures of our set up have been on our webpage for more than 10 years. It would be very easy for any company selling engines at Oshkosh to have built their own version. Easy, but not as easy as telling people they have hundred of hours of testing, but forgot to take any photos. 2003- Above, Oil system testing at Spruce Creek airport, 2003. We were testing how much pressure loss the cooler had when the oil in it was cold soaked for an hour at 32F. Testing like this is serious business. Note that Gus Warren liked Becks Dark, and I liked Michelob. Lot’s of companies like to have the appearance that they test products: they put people in lab coats and have them make scientific faces. I don’t care for appearances, I just want results, and the picture shows we drank beer while we let the oil cool off. I can put on a lab coat a lot faster than a salesman can become a motor head and teach builders anything valuable. 2004- Above, an O-200 on our dynamomemter; test crew from left to right, above: Gus Warren, Detroit Institute of Aeronautics, A&P 1990; Steve Upson, Northrop University, A&P 1976; yours truly, William Wynne, Embry-Riddle Aeronautical University, A&P 1991. While the way we dress may be slow to catch on in high fashion circles, we certainly know our stuff about all types of aircraft powerplants. 2008- Above, Kevin and I are standing on my front yard, wearing jackets. We were waiting just before sunset for a rare weather phenomena to occur: a perfect standard day of 59F 50% relative humidity and a pressure of 29.92. Any time you read a dyno report and it says “corrected horsepower,” they’re making a calculation, sometimes accurate and sometimes not, to adjust for their test conditions not being at standard atmosphere. Because we live in Florida near sea level, there was actually three occasions in four years when these conditions were met on testing days, and all our results we calibrated against these standards. 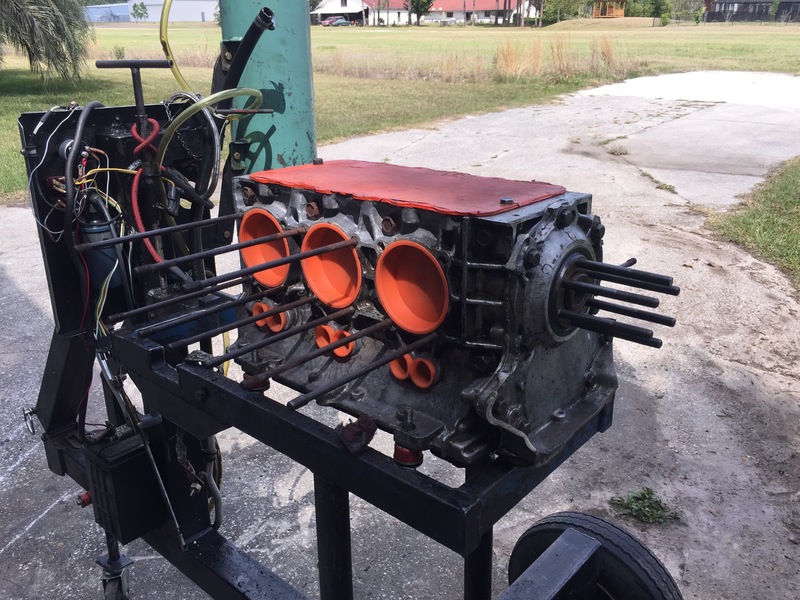 This page is a collection of notes on the broad variety of Carbs that have flown on the Corvair, and some thought on why I choose simplicity when it is available, and the development of our intake manifolds. Above, an overhaulled NAS-3 that went on the Pietenpol of Dave Minsink. A story of why builders professional background tend to choose carbs. Notes on why the intake works so well. A story of testing a $160 carburetor. A question of Carb location…..
A warning about top mount carbs. Good photos of a straight MA3. Below are the Group numbers of our intakes and the numbers we assigned to the popular Corvair carbs. You can see how this is part of our Group numbering system by studying the complete numbering system on the “Prices” section of our main page, FlyCorvair.com. Below are to section from my Group numbering notebook. The first is the introduction to the carb section, and the second is an outline on intake manifold options. Where most companies are just trying to get you to buy something, my goal is to have you learn about, and really understand the machine you are building. The starting point on any subset of knowledge that goes into your plane is understanding the mechanical philosophy behind the choices made by successful builders. When it comes to carbs, I like Strombergs and MA3s because they have literally millions of hours feeding air and fuel into flight engines. I know them and trust them, and if I had any little issue with one, I have mountain of expertise to draw on, not just other people flying one, but pros at fuel system repair stations. These carbs will always be my first choice to put on a plane because they are aircraft carbs, they are not just playing the role. They are doing the job they were designed to. My father is a lifelong military engineer who spent a lot of time working in places where the people who don’t like your project are literally going to try to kill you. He upholds that the piece of machinery that has the greatest reliability requirement is the combat firearm. In these tools, reliability is an absolute requirement. All other considerations about them – weight, accuracy, firepower, cost, etc. – all are meaningless if you ever need to use one and squeezing the trigger produces a soft noise rather than a loud one. Notice that the requirements of aircraft carbs are very much like combat firearms. When you push the throttle in, you really want to hear a loud noise, not a soft one. If your glide path leads to a place 200 feet short of the runway threshold, and pushing the throttle in gives the undesired soft noise, you will not be comforted by thoughts of how cheap, how light, how available, easy to tune or install it was, or any other factor that made it attractive in the hangar. Reliability alone gets you back to the airport. Consider this: The Stromberg on my wife’s plane was made just about the same time that the Soviet Red Army adopted a device called the AK-47. Sixty plus years later, both of these devices have been used in countless numbers all over the globe. Both are often criticized as outdated, inefficient, inaccurate and stone age. Notice that their continued use in the face of all criticism is justified by the same three word sentence, “It is reliable.” People who have held either one in their hands, stared at its metal parts and though about how they would need to count on it, will have some appreciation for that three word sentence. If I can teach you only one thing about experimental aircraft, let it be this: There is no characteristic more important than reliability. Anything you could get in trade for reliability isn’t worth it. A lot of builders question the length of the intake runners on our systems. Contrary to appearance, in operation, the throttle response is nearly instantaneous. Look at any modern car; designers are going to great trouble to make the intake runners much longer, not shorter. They are after more torque in the rpm range that direct drive engines fly at. A long intake tract doesn’t mean less power, and I am not sure where that myth started, but you can take a look at things as diverse as a tunnel ram with dual quads on a V-8 and see that even 7,500 rpm drag cars benefit from longer runners. But you need not be concerned with theory, I have a lot of dyno information that compares a huge variety of induction systems, and I can assure you that a long tract with a single carb pays no penalty while offering many advantages. Many people are yet to understand that the reason why you can go out and fly a Cessna 150 and expect it to work is that Cessna made one in 1959, made it work perfectly, and for the next 18 years produced clones of it, and had an army of mechanics making sure the clones stayed clones, and didn’t develop individual personalities. You can make this work for you on your Corvair carb of choice as long as you understand the difference between the terms “Clone” and “Replica.” Listed below are a number of carbs that have proven over time to work on a Corvair. No matter which one you choose, I strongly suggest you make your fuel system a clone of a flight proven aircraft using the same carb you select. Pick any carb you like, and install and operate it just like a person who is successfully flying the same carb on a Corvair. And then don’t worry about what anyone else is doing. This will work every time. Here is what never works: A guy jumping from idea to idea and getting speculation and commentary to make a choice for him, having it not work because the system he builds is subtly different than others. Maybe he is not good at taking input from others, and when it is all said and done, he publicly pronounces that there is something wrong with each of the carbs, or maybe the Corvair’s intake design, or auto engines in general. Many people are actually prone to taking the second path because they are more comfortable being negative, “proving” that things won’t work, (even though they are flying on other planes), and passing negative judgments on things. It is just how some people are. I try to ignore it because teaching people about aircraft, not correcting social disorders, is the focus of my work. You don’t need a majority of builders to like the carb you are going to use. Here is what is needed in the carb you choose: To have flown on the same airframe, with the same fuel system (i.e. gravity feed or fuel pumps); it needs to have flown more than a year and 100 hours with someone you can converse with or who shares their notes; and you need to be able to buy the carb, parts and service for it. That’s it. That constitutes a system that can be successfully cloned. One of my favorite sayings: “Early bird gets the worm, but the second mouse gets the cheese.” If you don’t want to get your head caught in a trap, be the second mouse, build a clone. Right now, in the land of Corvairs, you can clone a system of any of the first four carbs I list. You are going to have to do some pioneering work on the other installations. Every variable you add as the first mouse has the possibility of putting a big dent on the back of your head. If the imagery isn’t appealing, you can avoid the subject entirely by building a clone. It is my strongest recommendation not to use any type of motorcycle carb. This includes a Revflow, a Keihin, an S&S, an Altimizer, a Mikuni, a Harley-Zenith, and especially not a Bing. If I were required to list all the ways that a motorcycle or other non-aviation design carb could fail, I would have a long list. For example, the Bing throttle isn’t connected to the cable, and many CV motorcycle carbs have this “feature.” The two biggest failures that I can name is throttle systems that are operated by bicycle cables and the fact that most motorcycle carbs don’t have any way in which you can attach a serious fuel line. A piece of fish tank tubing and a hose clamp is not serious, and if it works on a Rotax 503 in a cowl-less pusher application, that doesn’t mean it will live in a sealed engine compartment in a traditional aircraft. Throw in that they have no mixture control, and often don’t fit where aircraft carbs do, and you get to a better understanding why there isn’t anyone saying how well the combination worked on the first 100 hours on his Corvair powered plane. My least favorite carb in this genre is the Bing. It has a tendency to lean out on long manifolds, and it will actually shut off if subjected to ram air. In 2012, we had a builder who insisted on using one and did $3,000 in detonation damage to his engine on the first flight. The same plane would have flown perfectly fine on a $500 Stromberg. I am sure the bystanders to this event were far more willing to see the issue as a Corvair problem than to understand that it was caused by a poor German motorcycle carb mis-applied to a proven engine. Carbs salvaged off snowmobiles, outboards, imported cars and lawn equipment are never going to have a good record on planes, and their advocacy is limited to people who wish to impress others with cleverness, but never actually impress people by going flying. Again, I don’t find it my responsibility to define all the ways that will not work for people who don’t wish to go with something proven. I spend my time trying to illustrate positive examples of how to do things that will work economically, but above all else, reliably. The Intake manifolds that we make for Corvairs evolved slowly over time and testing. Originally we made individual manifolds out of welded sections of mild steel tubing. We tested both 1.375” and 1.5” tubing, both on the ground and in the air. After a lot of evaluation, we went with the larger size from 2001 on. In 2003, we started having the main tube of the manifolds bent by a CNC tubing bender as a single piece. This eliminated a lot of welded joints and gives the manifolds a much cleaner appearance. We looked at several different materials and selected thin wall 304 series stainless steel tubing. The primary reasons for this choice are that it is essentially immune to stress cracks when TIG welded and purged correctly, it remains clean on the inside and will not rust even if the aircraft sits for a long time in humid weather, and it is as light as an aluminum manifold because the aluminum would have to be made much thicker to have the same strength and crack resistance. After nearly 10 years of continuous production, our manifolds still have a perfect track record. When first looking at the layout of the manifold, many people think that it will not have sharp throttle response, or the length of the runners will hurt the power output. A builder with a background in motorcycle racing confessed that he first thought of a steamship’s engine telegraph where the bridge swings a big lever on a pedestal that rings a bell in the engine room and makes a hand on a clock face point to the words “Full Ahead.” After he built his Corvair engine, he was surprised to find out that the throttle response on it was just as fast as a typical car. On aircraft, the limiting factor on how fast it can change rpm is the moment of inertia of the propeller assembly. On Corvairs, this is inherently low and the engine accelerates noticeably faster than other aircraft engines, even with a long intake tract. I have years of dyno testing of every type of intake length and carb configuration that conclusively shows that the length of the intake run has no effect on power output. For years this was a favorite Internet debate topic among people who had never seen a Corvair turn a prop, but felt certain that the world needed to hear their impression of how it worked in their imagination. A number of these people also advocated putting the carb on top of the engine. I am going to flat out say that I have never found a single good reason to do so, and there are a number of very good safety reasons to have it on the bottom. I have seen people run every carb on top from Bings to Webers, and none of these installations worked nearly as well as even Bernard Pietenpol’s 1960s installations that featured tractor carbs mounted below the engine. 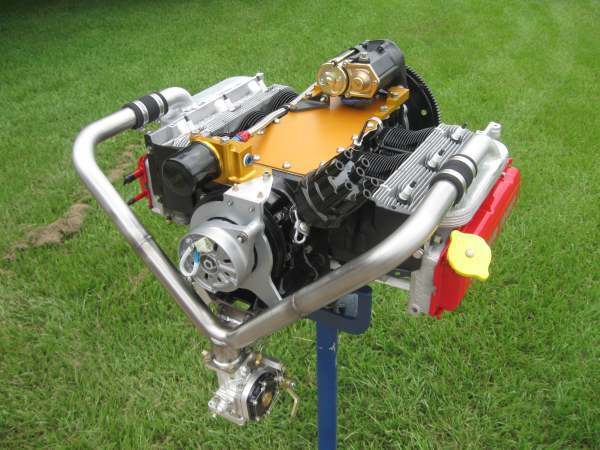 I have seen more than one person plan on running an AeroCarb with a fuel pump mounted on top of a Corvair engine. Such a combination is virtually guaranteed to leak fuel onto the engine in operation. If a person is that interested in cremation, they should just find the professional service in the Yellow Pages and skip all the hassle of building a plane. I will not knowingly assist anyone who puts a carb on top of an engine or uses the leak prone stock Corvair mechanical fuel pump, and especially not in combination. There are always “experts” who claim that individual runners to each intake will make more power, that something is wrong with the offset intake pattern on the Corvairs intake log, or that the log should be removed. These are all myths that I long ago disproved with our dyno on back to back runs. In section 3700 look at the photo of Mark Petniunas’ EFI engine running on my dyno; it has individual runners and made no more power; the offset intake patter appears on many other aircraft engines such as Rangers and Allison 1710cid V-12s (good enough for P-38s P-40s and P-51Bs, probably good enough for homebuilts). The log part of the head is an important part of the mixture distribution, and it is structurally part of the head. If you mill it off you will weaken the head and blow the head gasket because the upper row of head bolts will no longer have a stiffener. Do not listen to anyone who suggests such modifications to the heads. We make several different manifolds for the Corvair. The most common is the 3601(S) which is the standard manifold for anyone mounting a Stromberg, MA3 or any other float type carb on their engine. This fits all the Zeniths, KRs, Tailwinds, etc. The second design is a 3601(E) which is the same manifold with the carb flange rotated 13 degrees forward. This is specifically made to serve Zenith builders who are putting a flat slide carb like an Ellison, Rotec or an AeroCarb on a tricycle landing geared airframe. The rotated carb flange provides clearance to the nose gear. The 3601(C) manifold is specifically made to fit a Corvair into a Sonex or Waiex airframe using the Wesesman’s installation components. The fourth manifold is the 3601(P) which is specifically designed to use on single seat aircraft and those with narrow upper motor mount spacing, such as some Pietenpols. If you need further guidance, look at out parts catalog at FlyCorvair.com/products.html, give us a call or send a note. Here is one spot where we have collected a number of different stories on Fuel injection for Corvair aircraft onto a single reference page. Like the other reference pages, it is a central starting point on the topic, and easy to keep updated or make additions to. If you are interested in learning more about this topic, read on, there is a significant amount of information here. If I were to pick a single topic that new builders are interested in, but know little about the applications of, It would be Fuel Injection. This is a topic dominated by misconceptions and myths. Here is a quick check: Do you think that a port fuel injection engine or one with a carb on a long intake manifold makes more power? Would you be surprised to learn that the evaporative cooling effect of the carbs fuel delivery can give it a significant advantage? It does, and to learn this and many other points on reliability, read on. Unlike much of the info on the net from armchair experts, the information below is straight from experience and testing…in aviation settings, not in cars. 2) A full print of my Group numbering system #3700 EFI notes. 5) A 385 mph EFI plane and some final thoughts. Above, a rear view of the Panther engine. Mounted on the intake is a Precision Mechanical fuel injection system. Initially, these was the planned fuel system for the Panther, but after careful evaluation, Dan Weseman opted to go with a very simple MA3-SPA carb. All of the aerobatic flights on video on the Panther site are done with a one barrel aircraft carb, not injection. Covers that EFI is Group #3700 and Mechanical injection is Group #3800. The only successful flying EFI Corvair powered plane. A hard won achievement. Many people just arriving in aviation are interested in electronic fuel injection. Some homebuilders are impressed with its performance in cars or have read about one of the handful of experimental aircraft flying with fuel injection. After listening closely to builders, I discerned their interest originated from five reasons: 1) They thought it would make the engine more powerful; 2) They thought it would reduce fuel consumption; 3) They felt that it would eliminate the possibility of carb ice and eliminate the need for carb heat; 4) They thought it would be more reliable than a carb, or; 5) They just wanted to try it. Experience has shown me that the first four are not true to any meaningful degree, and that #5 is the only reason that makes sense. If you are pursuing EFI for reasons #1-4, you are going to be disappointed, but if #5 is your motivation, then the project may be a success to you. Let me first say that I am not against EFI, but I think that builders should know the facts before they pursue it. My background on EFI installations in planes is better than most. A guy who works on them all the time in cars, but doesn’t put them in planes, has a long way to go before he learns what he needs to know to be reliably and safely flying. I did a lot of work on Jim Rahm’s 427 cid V-8 Lancair IVP. It had the best EFI system in the air. We had the best people working on it, a nearly unlimited budget and experience that no homebuilder in his garage could match. It took a lot of very hard work to make it the reliable system. Just because Jim’s motor made 600 HP and you only want 120 HP doesn’t mean that solving the installation issues will only cost you 1/5 the time and money. And even if it did, we would still be speaking of time by the calendar years and money by the cubic foot. When I read discussions on the Net about EFI on experimental aircraft, I can quickly tell who has never assembled and flown a system. 95% of the advice on the Net is offered by people without flight experience. Out of the 30,000 experimental aircraft in the U.S., I am fairly sure that less than 300 of them have EFI. I cannot think of a single significant aviation record below 500 HP that is held by an EFI engine. There have been many clever people who put a lot of effort into EFI on planes, with little result. 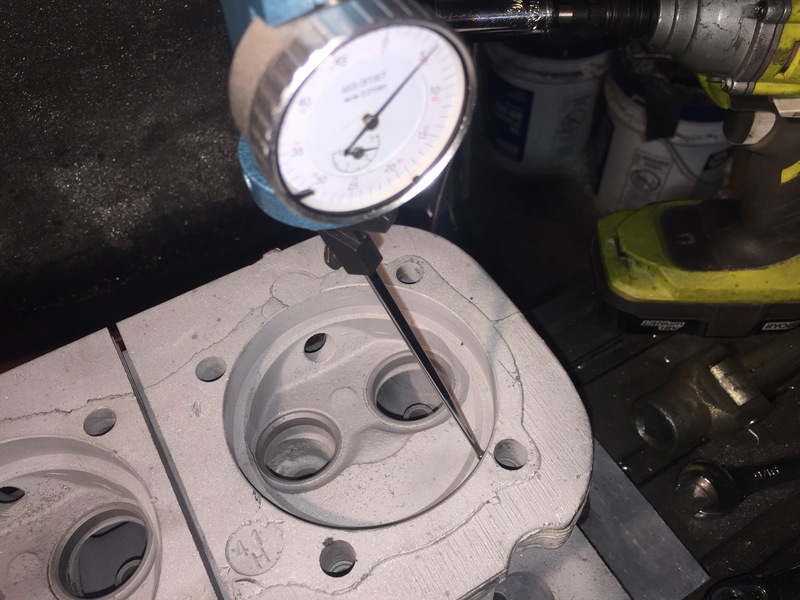 No matter what caliber of auto mechanic you are, experience says that you will find exceeding the performance of carbs or mechanical injectors very difficult, and EFI may never have the reliability record of the simple 1 barrel carb. Out of the roughly 300 experimentals flying with EFI, the vast majority of them are using 1990s auto engines with EFI from the factory. In this case, the factory engineers did most of the work. If you think about it, there are very few motors like O-200s, VWs and Corvairs flying on EFI. And the ones flying can’t boast the flight record of carbureted engines. I have seen a number of these planes flying with 35psi fuel pumps inside the cockpit with barbed hose connections and hose clamps. No one should dream of flying things like this. Let’s examine the points one by one objectively to learn about the issues and make an informed decision. 1) I have seen claims that EFI makes the same engine 30% more powerful. Nothing of the sort is true. Engines make power because they burn a mass of air mixed with the right amount of fuel. There is no way that an engine is going to inhale significantly more air because it doesn’t have a venturi carb. This advantage is slight, and would be well below 5% on an engine like a Corvair. To see any more difference than this, the cylinder heads and intake tract would need to be designed for it right from the start, by very smart people with a lot of sophisticated equipment (of the caliber found in Detroit factories). Slapping an EFI system on the Corvair will not have the same effect. Fuel injected motors are said to make slightly more power because the fuel is better atomized. But carbs, even simple ones, are surprisingly good at this. The amount of records still held in racing by carbs should tell anyone that the EFI power advantage is minimal. Carbs have a very serious advantage of vaporizing the fuel well upstream, and having the air/fuel mixture cooled and its density increased. In almost every case, this offsets any gain in power from atomized fuel. When running at power, Corvair intake manifolds are cold to the touch from vaporizing fuel. EFI does not have this effect. 2) EFI will not significantly reduce fuel burn in a Corvair engine. For best economy, engines need to run a lean mixture. EFI has the theoretical ability to atomize fuel slightly better allowing it to run slightly leaner mixtures than a carb could without detonating. In actual use, it is foolish to run an engine this close to detonation. Modern auto engines can do this because they have computer-controlled ignition tied to a knock sensor and the fuel injection. Without these devices, any significant fuel burn advantage is lost. Many of the well known auto power proponents, even those who work with computer controlled EFI engines, clearly state that EFI doesn’t significantly reduce fuel burn for a given HP in aircraft engines. The efficiency advantage in cars is gained by running in “closed loop” with air/fuel ratios near 14:1. Under this operation, the injectors are fine tuned by reading the O2 sensors many times a second. The reality that few new builders understand is that any engine running at 75% or more power has to be running an air fuel ratio of 12:1. At this setting, O2 sensors don’t reliably work, and the system will operate in open loop, forfeiting any efficiency gains while retaining all the complexity and vulnerability. I have never seen any EFI flight engine that will fly at cruise power in closed loop mode. They are all just operating off a set of pre-programmed values based on RPM and MAP. These can be very crude, as some aftermarket EFI systems have RPM increments as rough as 250 RPM. In cars this would be masked by the O2 sensor moderating the injectors, but it can’t when it is in open loop. It is technical reasons like this that allow carbs to often demonstrate smoother operation than EFI in experimental aircraft. 3) EFI is less prone to carb ice, but is not immune to this trouble. There are still conditions that can cause this trouble. Almost all injected engines have an alternate air source. Homebuilt aircraft in Canada are required to have heated alternate air no matter what the fuel system is, and there is good logic to this. For a more complete discussion of this, see the article on carb ice at the end of the Manual. 4) Many people feel that EFI will free them from things like carb ice, reducing their level of risk in flight. While the risk of carb ice would be reduced for a pilot too careless to use carb heat, many new risks are introduced. EFI requires high pressure pumps, regulators and lines; it can be stopped by a piece of trash in the fuel that a carb would easily pass; its numerous electrical connections are prone to failure by corrosion or poor crimping; and the whole thing is so electrically dependant that most people fly with two batteries. Contrast this with a gravity feed fuel system in a plane with distributor ignition which will run for hours on a small battery with no input from an alternator. You cannot focus on the one possible advantage of a system without considering all the downsides that come with it. Automotive EFI installations are reliable today because auto makers spent literally billions to make them so. Brilliant people in Detroit who are specialists in dozens of details of the installations and privy to incredibly accurate statistical data on failures allow them a great corporate body of experience to tap into with every installation. It is my feeling that anyone looking into EFI who states that it is more reliable is making an argument for the car, not what an individual homebuilder can do in a plane, where a single detail of installation may compromise the system. My observations on reliability are simple: Any system that uses lower pressure fuel is less likely to leak. Gravity is better than 5 PSI, and 5 PSI is better than 40 ; any system that uses no electricity is better than one that uses a little, and one that uses a little is better than one that uses a lot, especially if the one that uses a lot needs it to be a certain voltage; any system that has less parts and connections is less likely to fail,; digital electronic connections, working a low voltages, are very sensitive to corrosion, temperature, and vibration, things planes produce more than newer cars. 5) Being an experimenter at heart and wanting to address the challenges of an EFI installation is a valid reason for trying it. You know a good, reliable and airworthy system is quite a challenge because you don’t see them often. Anyone who achieved this could be justifiably proud of his creation and would learn a lot along the way. A person who is motivated by this will be satisfied when it works, whereas people motivated by #1 – #4 are bound to be disappointed when EFI cannot live up to the overblown claims many armchair/Internet experts make for it. The only good reason to work on an EFI Corvair is because you want a challenge, and this is more important than finishing your plane soon, or operating at a lower risk level. This is a valid position, and I support anyone who knowingly makes it. At 8 a.m. on December 24th 2008, I was driving my 175,000 mile EFI S-10 up I-95 at 75mph. I had promised my parents that I would make it to their house for Christmas Eve dinner. I had never had a bit of trouble with this EFI engine. Near Richmond, Va., it quickly died out, and I was only able to coax it into a truck stop at 10% power. A morning of diagnosis showed that the pressure regulator had died. It was not in an easy place to get to, no one had a replacement and the truck was worth maybe $500 before it was broken. I gave the truck to a 20-year-old tow truck driver wearing a Chevy hat and a Jack Daniels sweatshirt, as a trade for a ride to a car rental place. We got there 10 minutes before they closed. The driver asked me several times if I was really giving him the truck and if I really was from New Jersey. The experience was counter to many things he had been told about people from N.J. After some reservation, he took the gift of a truck from a Yankee on the eve of the birth of Jesus to have special significance. Such a warning less failure in a plane might prove to be lethal. Note that aircraft carbs almost always run even when they are having an issue. A good look inside Pat Panzera’s Contact! magazine issue #96 shows a destroyed homebuilt aircraft, product of a sudden EFI failure. Here is a story of a guy who may have felt that carbs and engines without O2 sensors were stone age. Maybe, but stone age tools are noted for reliability. I am glad the builder was not more seriously hurt. Over the years, a number of people have written to explain that they are going to engineer their own EFI systems, or use something called “shareware” to program one (the blind leading the blind on the Net). Out of perhaps 50 people who have written this, not a single one of them went on to produce a running EFI engine. Experience tells me that people who arrive with a big flourish and little consideration for what has been accomplished have a very low chance of flying anything. A modest search on the internet will reveal many people speaking about EFI for Corvair powered planes. Armed with the information I have printed above, you can debunk most of the claims people make. Still, there are people who present a case to new builders as if they are some type of experienced expert to be followed. The internet is an odd storage device. I holds more old trash better than any landfill on earth, and it keeps it fresh, even long after the project was abandoned. Let me share by example: Don’t waste the time to look it up, but there is a long detailed website run by “Haynes Engineering.” Sounds official, but it was just one guy in a barn who had never built a flying plane before, offering a long how to session on putting EFI on a Corvair in a Zenith 601. I never met the guy, but I did email him several times, and he spent a long time on Mark Langford’s discussion list, where he had many fans who eagerly awaited Mr Haynes demonstrating all the things he promised from is Harley Davidson salvaged system. Although I offered to publicly test run his engine at a college, Mr. Haynes soon despised me, probably for not recognizing his brilliance. His website is all about putting a Corvair on a 601, but makes no mention of Our success with doing this, or my work at all. If you have built planes, it was easy to see that Haynes didn’t know much about planes, but had the kind of ego that didn’t like admitting that. He was a foolish cheap skate, ‘rebuilding’ his engine with a used cam and worn gear, and using angle iron to build a motor mount. His EFI system had hard aluminum lines where it needed flex ones, and he spent a lot of time trying to use a little outboard starter. In the end, after getting many green guys excited, he couldn’t make the engine run, and instead started it for 5 seconds on starter fluid, and then wrote a post to the internet silmaltainiously declaring victory and quitting airplane building altogether. Does this sound like a stable person who you can learn from? Is it the kind of information that you want to bet your life on? This was years ago, yet I saw the website just last week, with no mention of the system never working or the whole aircraft project being abandoned. If you are new to home building, the quicker you learn never to be distracted for real progress by day dreamers and fools without experience, is the quicker that you will learn what really works, and how to incorporate these skills into your own experience and your own plane. The internet will provide an endless stream of people like that. 80% of the people who start a homebuilt do not finish. Be determined to be in the 20%. One of the things that the 20%ers all have in common is not getting sidetracked by fools. I’m known for advocating simplicity in aircraft engines. This recommendation comes from my experience on the opposite end of aircraft powerplants. Above, Arnold Holmes (host of CC#17,#25, #29) and I stand behind the engine installation on a V-8 powered Lancair IV-P. This is an EngineAir package that I helped develop from 1993 to ’98. It’s 450hp, geared, injected, intercooled and turboed, and features air conditioning. Get a good look at the size of the 5-blade MT propeller. Eventually, about a dozen of these took to the air. They were stunning performers. I flew from Oshkosh to Daytona Beach in three hours and five minutes in our first airplane, N420HP. This aircraft is on the cover of Sport Aviation in July ’97. If someone suggests I don’t understand EFI, ask them if they have flown in a 385 mph EFI plane they helped develop and build. The development of this engine took the work of many clever, dedicated people, and one guy with cubic yards of money, Jim Rahm. It worked, but taught me that homebuilders at all levels tremendously underestimate the effects of complication, primarily its delays and expenses. Whenever I read discussions about electronic injection or computer controlled engines, I can tell in an instant who has no practical experience with attempting to prepare these systems for flight. I have collected in this one story a complete overview of the Corvair power option for builders considering or working on the SPA Panther kit aircraft and Sonex airframes. These two aircraft are grouped together because both of these installations were developed by Dan Weseman, (SPA is his company) who offers airframe components that seamlessly work with our Corvair engine components. Above, Oshkosh 2013: Dan Weseman selected the Corvair as the engine for his Panther prototype. He did not make the choice lightly. He has hundreds of hours of Corvair flight experience, developed the highly successful “Cleanex” (Corvair powered Sonex airframe combo), manufactures a number of Corvair flight products like 5th bearings and Billet Cranks, and is well known and respected in the Corvair movement. 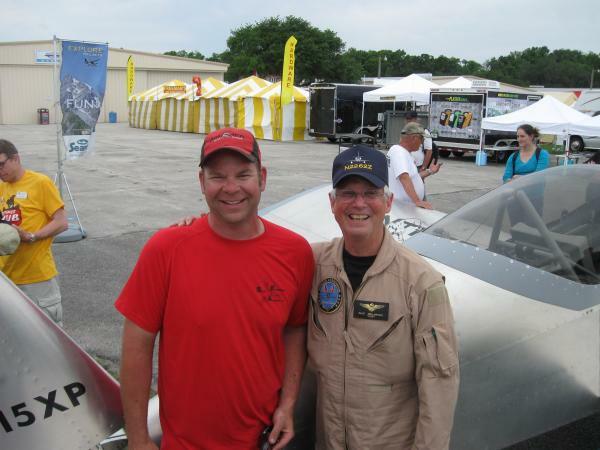 In 2009, we awarded him The Cherry Grove Trophy , as Corvair Aviator of the year. The Panther was designed to take a very broad variety of engines from large VW’s to 160hp Lycomings. Dan has extensive flight and ownership experience with most Common light aircraft engines, but he selected the Corvair as his chosen introduction engine for the Panther for a number of good reasons. Not only is the engine powerful, smooth and reliable, it also supports Dan’s mission of keeping the plane affordable for rank and file homebuilders. No rational man introduces a new aircraft with an engine he must make excuses for. Dan knew the Corvair would not disappoint the industry people and media who would be invited to fly the prototype. The most common thing said by highly experienced builders and designers who see the Panther perform 170 mph low passes, 1600 fpm climbs and aerobatic maneuvers is “I can’t believe that is powered by a car engine.” The Corvair in this installation has the performance to change aviators perspectives on the capabilities of auto conversion engines. Paul Dye, Editor in chief of Kitplanes, came to Florida to fly the plane. Very impressed, on the engine he commented that it functioned just like a Lycoming, just much smoother. Above, Paul Dye, editor of Kitplanes returns from his flight in the Panther. If would like to read about how this airframe flight tested Billet Cranks Made In The USA, click on the story title. Above, enroute to Corvair College #16, ‘Son of Cleanex’ builder/pilot Chris Smith shot this photo of Dan Weseman off his wing as they flew up from Florida in loose formation. Although it is not for everyone, the Corvair when installed correctly in the Sonex airframe provided a high performance engine that is essentially immune to overheating issues. 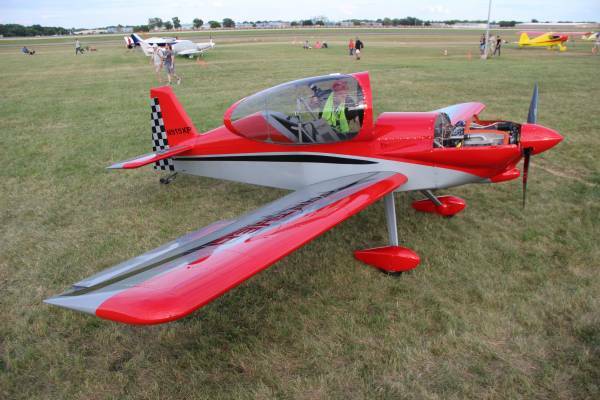 The Sonex is an outstanding light aircraft designed by John Monnett. It, and the Y-tailed Waiex have sold hundreds of aircraft kits. For 10 years,the Sonex factory approved only three engines for the airframe: the 2,180cc VW, and the 80 hp and 120 hp Jabbirus. The factory position firmly asserted that for an aircraft to be a Sonex, it must have one of these three engines. We’re personal friends with the Monnett family, and to respect their wishes, I carefully referred to the combination as a Corvair powered Sonex airframe, or Dan’s development as a “Cleanex” (a name Dan was slow to grow fond of.) I picked the name because Dan’s plane was a very clean build, that most people were stunned to find out was plans built, not a kit. Dan’s plane is an outstanding performer. I flew in it with Dan, on an 85 degree day off our 2,400′ tree-lined grass airstrip in Florida. At the time our combined weight was 430 pounds and we had 12 gallons in the tank. If anyone tells you that VW’s are as powerful as Corvairs, they simply have never seen a Corvair in action. Dan’s plane could do an honest 155 mph on 5 gallon’s an hour, and top out above 175 mph. Dan demonstrated many times that he could run the plane flat out at top speed for more than 40 minutes without the engine running hot. I offered an opinionated Jabaru 3300 pilot $1,000 cash if his plane could beat Dan’s over a 100 mile course. He didn’t take me up on it for a simple reason: he was afraid if he ran his $18K engine that hard for 40 minutes he would cook it. The speed would have required running the Jabaru 500 rpm over its factory approved continuous rating. GM designed the Corvair with a 5,500 rpm redline and a 575F CHT limit. Even at top speed, Dan’s Corvair is only using a fraction of these ratings. The is the key element in the Corvair’s reputation as a very robust power plant. It is approximately 25 pounds heavier than a 3300; much of the weight difference is in the Corvair’s cylinder heads which are literally covered in deep cooling fins. 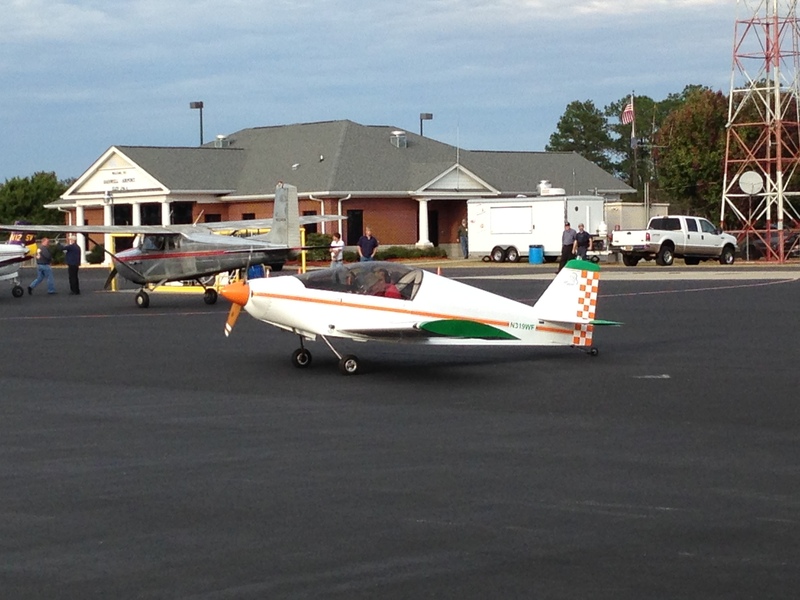 Above, Dan and his Cleanex in front of my hangar at Corvair College #8. (2004) Until his airplane was done and flying, we kept Dan’s identity a mystery. At the time, a few people who saw this photo made jokes about the “Builder Protection Program” with a nod toward John Monnett’s allegededly sharp temper about people putting other engines in his designs. In reality, Dan is friends with the Monnetts. The Cigarette was part of the ploy, Dan has never been a smoker. Today, Sonex ltd. has a much more relaxed attitude about alternative engines. In the above photo is from sun n Fun 2012, eight years later. Building a “cleanex” has a fun side also, where builders like to keep ‘traditions.’ From our 2012 SnF coverage, a picture and a comment that pre-dates the policy change by the Monnetts: “A Sonex builder next to Dan. We are having a good laugh disguising his identity because on his shoulder is a motor mount that mates the Sonex airframe to a Corvair engine, creating a “Cleanex.” Here we are kidding around about the man in the yellow shirt entering “The Builder Identity Protection Program” because the combination is not approved by John Monnett, the airframe’s designer. In years past, John was known for having low tolerance for people modifying his excellent airframe designs. Truthfully, I know him fairly well and he really doesn’t get that upset about it as long as builders choosing other engines do not level unfair criticism at his selected engines. There are now about 10 Cleanexes flying, and Dan is glad to work with any builder who has chosen the combination as long as they respectfully avoid Internet comments that would raise John Monnett’s blood pressure. Many people have seen Dan and Grace flying aerobatics in “The Wicked Cleanex” on our Corvair Flyer #1 DVD. Continuous use of this type of operation led Dan to independently develop his own simple, retrofitable fifth bearing setup to reduce flight loads on the Corvair’s crankshaft. You can read about it on his website fly5thbearing.com. While people just getting into aviation occasionally view Dan’s flying as daring, I want to emphasize that it is a smooth display of skill and has nothing to do with daring or risk taking. I’ve gotten to know him pretty well, and around airplanes, Dan is pretty conservative. I would easily name him the steadiest pilot and most meticulous maintenance guy in the land of Corvairs. Above is an early (2006) view of the Cleanex engine. Our Gold Hub and Front Starter system are clearly visible in the photo. Note that all of the engines we build have Lycoming style starter ring gears on the prop end of the engine. All of Dan’s installations use our arrangement. In the past, a handful of homebuilders and here today, gone tomorrow outfits put the ring gear on the firewall end of the Corvair. On a Sonex airframe, it is a critical that no builder operate with such a location because it puts the exposed, spinning, ring gear very close to the Sonex’s plastic fuel filler neck, which could lead to a disaster in an otherwise minor accident. To fly a ‘rear starter’ in a Sonex airframe is foolish, to promote it would be amoral. Our approach to serving builders is different than typical businesses geared only to sell things to consumers. Our goal is to assist you on your path to becoming a more skilled aviator. The products we sell support this, but simply getting you to buy things is not what I am in aviation to accomplish. 5) Flying Panther and Cleanex info. I will be glad to answer further questions just email WilliamTCA@aol.com or call 904-529-0006. You can also check our two websites, https://flycorvair.net/ , http://flycorvair.com/ . The first is our ‘newspaper’ the second is our ‘library’ and ‘store.’ The links below are stories that already appear on these two sites, they are just arranged here to support this introduction to Corvair power for Panther and Cleanex builders. For installation components in section four, contact Dan and Rachel directly. In the foreground above is Dan Weseman’s Wicked Cleanex. Off his wing, Chris Smith flies the Son Of Cleanex. The photo was taken over a bend in the St. Johns River in North Florida. Above, a 3,000 cc Corvair, The actual engine in the Panther Prototype. The Corvair is an inherently simple engine, It’s opposed six configuration makes it the smoothest of available power plants. It has outstanding cooling because GM put a tremendous amount of cooling fins on it and gave it a factory CHT redline of 575F. All of our engine parts are made in the United States, as are the airframe parts from SPA. The engine can be built in three displacements with three respective power outputs. They are 2,700cc / 100HP, 2,850cc / 110HP and 3,000cc / 120HP. The two smaller displacements weigh 230 pounds, the larger actually weighs 8 pounds less because it uses lighter cylinders. All engines are completely rebuilt from very high quality parts before flight. They are not just removed from cars. The parts we use are specifically selected to convert the engine for the rigors of flight use. Forged pistons, Inconel valves, chrome rings, ARP rod bolts and many other components are upgraded in the rebuild. To absorb the propeller and flight loads a “5th bearing” is added. It is a billet housing with a very large bearing from a V-8, bolted on the end of the case. The ignition is redundant and utilizes two 40,000 volt systems, one driven by digital electronics the size of a match book, the other by a traditional set of points. The engine is direct drive, it has no complex reduction unit. It makes good thrust because it has more than twice the cubic inches of a Rotax 912. All of the systems on the engine are intentionally patterned after those on Lycomings and Continentals, because they are the model of success in proven aircraft power plants. People who do not acknowledge certified engines as excellent models of success are often just zealots. To succeed in experimental aviation you need dispassionate information not emotional opinion. We also have all of the ‘getting started’ series on a single page, at this link: Getting Started Reference page. If you would like to read above the value of proven engines, read: Why Not the Panther engine? c) – For an explanation of ‘flat rating’ and an engine build : Shop perspective: Mastery or ? f) A story about the evolution on 120HP Corvairs: 3,000 vs 3,100 cc Corvair engines. Above, a 2009 photo from our workshop. I kneel in the workshop next to motor mount Number 100 for the 601 XL. Most experimental aircraft companies, both large and small, fail because for two simple reasons; First, the ownership cannot physically make the product the sell, and second, their financial backers are unwilling to go several years before seeing the payoff. Neither of these conditions are true about our business nor SPA/Panther. We are craftsman and homebuilders first, and neither of us has partners nor investors. Few people new to experimental aviation understand that this is key to company stability and longevity, not big size nor flashy promotion. Normally we provide every part it takes to install a Corvair in your airframe. The Panther and the Cleanex are different because Dan developed these specific installations himself. It is important to understand that these installations work seamlessly with our engine components, and they are custom adaptations of systems that have long been proven to work very well. In the case of the Sonex airframe, there have been a handful of other people who tried, with poor results, to put a Corvair on that airframe. If you have heard a poor report on a Corvair powered Sonex, it is important to understand not all Corvairs in these airframes are people following Dan’s proven path. Being air cooled and carbureted, The Corvair is one of the easiest engines to install. Many companies that are good at selling things are poor at teaching things, like how to install their products. Teaching is the very cornerstone of my work, I am a skilled writer, we run Corvair Colleges, and we have a simple engine. All this adds up to a comparatively easy engine to install. There is no need to rush it, but I can do it working in one long day. Although the Panther is new, the systems are fully tested and well proven. It is important for builders to understand the engine test program went flawlessly because it used custom variations on proven systems. For example, the Panthers exhaust is made from the same materials and processes and uses similar design to the stainless systems we have made for other airframes for more than 10 years. The carburation, intake, cooling and spinner are also variations on long proven themes. Many people new to building initially think that very economical engines like the Corvair must also be inexpensive to install. In reality, the cost of items like motor mounts and cowls are not affected by the cost of the engine they mount and house. A mount for a $30K UL-350 and a $7K Corvair have about the same amount to tubing and welding time in them, and thus cost about the same. Most engines have installation kits with exhaust, cowl prop spinner etc, run from $3,000 to $6,000. The Corvair is near the bottom of this range, but the savings of using the Corvair is mostly in the engine, not the cost of installing it. Above, Chris Smiths plan’e uncowled with Dan’s in the background. A ground run cooling shroud sits atop Chris’s engine. Dan stand on the edge of this 2007 photo I took in his hangar. a) – For an example of 74 years of aircraft welding talent: Zenith 601/650 Motor mounts, P/N 4201(A) Both Vern and I are friends with Dan and assisted him with some of the welded parts that went into the Panther prototype. Dan is a skilled craftsman and a welder on par with us. b) – To learn about the Stainless exhausts we make: Stainless Steel Exhaust Systems . These are identical in material and construction to the Panther and Cleanex stainless systems. c) – Louis Kantor’s 601XL running for the first time in our front yard: http://www.youtube.com/watch?v=626uwVbc0gM The plane is one of more than a hundred Corvair powered planes that utilize Dan’s 5th bearing. Dan used his Cleanex as the chase plane on this planes first flight. Above, 2004 at Oshkosh: Next to our personal Corvair powered Zenith N-1777W, I explain our dual ignition arrangement two executives from Falcon insurance, The EAA’s provider. To offer real support, an alternative engine provider must be an effective advocate for his builders on many fronts, including meeting the requirements of underwriters. Just being an engine guru is not nearly enough. Corvair engines that follow our design, including to ones assembled by builders, are fully insurable at the lowest rates, right from the first flight, because they have an outstanding safety record. Having good effective hands on support is a critical element in this outstanding record. Builders selecting a Corvair for their Panther or Cleanex project have an advantage that is hard to overstate; Because Dan and I have been friends for more than 10 years, I am very familiar with both of his installations. I followed his Panther development from the first sketch through the flight test program. While the design can and will be flown on a broad variety of engines, it will be a long time before any other alternative engine provider understands the design and program as well I do. Many new builders mistakenly believe that they can marry any engine they like to their chosen airframe. In reality, compatibility goes far beyond horsepower ratings and weights. To be successful, it is critical that the engine match the designers perspectives on reliability, risk management and ethics. Differences on these subjects create issues builders can rarely resolve themselves; conversely, having both support teams share the same perspective gives builders strong allies. In 25 years of working with homebuilts I have met many designers and innovators I respect, but my personal perspectives share more common ground with Dan’s than any other person I know in this industry. Please take a moment to read: Panther Roll out. a) We have a flight operations manual with specific test flight plans and procedures: http://www.flycorvair.com/ops09.html Dan wrote one of the chapters in this manual to share his experience with Corvair builders. b) We hold 4 free hands on technical seminars called “Corvair Colleges” every year. For an introduction to Colleges, read this link: http://www.flycorvair.com/cc21.html An overview of upcoming colleges is at this link: Upcoming events, Airshows and Colleges #26-28. If you would like to see video of a College, here is a link to Corvair College #17 http://www.youtube.com/watch?v=wfa85e3ibI4&playnext=1&list=PL1D40A102EC2A194D&feature=results_video Dan and Rachel attend many of the colleges and were our Co-hosts at Corvair College #23.
c) Woody Harris, subject of this story: Zenith 601XL-2,850cc, Woody Harris Is our West Coast representative. Although we have held 5 Corvair Colleges in California, we only make one trip to the west per year. Woody covers all the shows and events from Arlington to Copper State when we can’t be there. Above, Chris Smith’s Cleanex after painting. 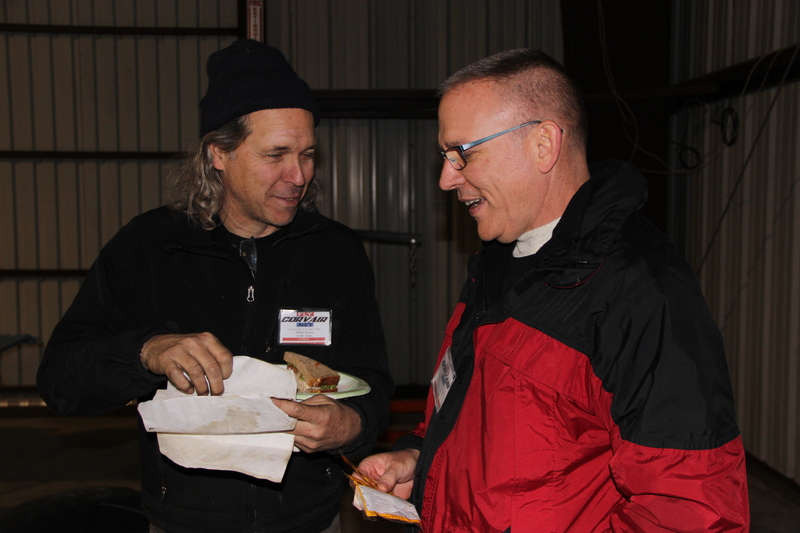 Chris was building a Sonex airframe from a kit and met Dan as Dan’s airplane neared completion. Chris opted to build a close copy of Dan’s aircraft. Although Chris had many years of flying experience, he had never built an aircraft before. Because of this, he wisely chose to follow Dan’s proven format closely. When Chris’ aircraft was done, it earned the nickname “Son of Cleanex.” It first flew at the end of 2006, and it served Chris through several hundred hours flying over the southeastern United States. Today the aircraft is owned by Ron Monson, who has put a great number of flying videos of it on You-tube. Above, Cleanex by Chuck Custer, after flying to Corvair College #25. This aircraft is one of approximately 12 that have flown utilizing Dan’s installation. Above, Clarence Dunkerley beside his 2850 cc Weseman bearing equipped powerplant destined for his Cleanex project. Sharp eyes will notice that this is equipped with the Reverse Gold Oil Filter Housing which we developed specifically for Corvairs going into Sonex airframes. Photo taken at Corvair College#21. Many experimental aircraft companies like to tout how many of their product has sold as a measure of success. Sales numbers on only a measure of their success, not that of builders. The only number that counts are how many builders that make it all the way to flying and enjoying their creation. It is a fact of marketing that it is far easier to keep finding new buyers to spend money than it is to support the ones that already spent the money, all the way through flight. This is why many aircraft companies have planned lifespans of only 48 months, so they make all the sales and fold up the tent before they have to do the real work of supporting builders. We are very different. I have been working with Corvair builders since 1989. I am in this for the long haul, and my measure of success is getting people flying. Likewise, Dan has been working with Corvairs since 2003, and has been offering parts like his 5th bearing design since 2006. If you select a Corvair engine, we will be your allies in completing your plane, just as I have been for many others before you. Above, Cliff Rose, Cleanex builder from Florida, with his 2700 cc, Weseman bearing, Falcon head engine with Reverse Gold Oil System. Cliff spared no expense to acquire all the parts of his engine. Still, he spent less than one third the cost of an imported engine. More importantly, he has the well earned pride of creating his own engine. Photo taken at Corvair College #19. Above, Aerospace engineer Paul Salter stands beside the Panther prototype. Paul is close friends with Dan and Rachel and has played a significant supporting role in the Panther introduction. 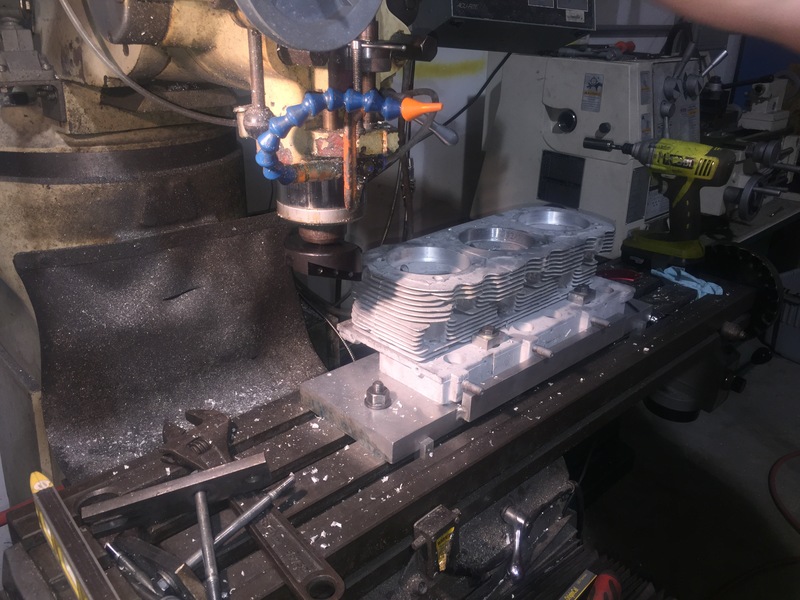 He is building Panther beta airframe #2 for himself, and he is already collected most of the parts to assemble his own 3,000cc /120hp Corvair, which will be a direct clone of the Corvair in Dan’s prototype. Above, Phil Maxson (Left) gets his airworthiness certificate for his 2700cc Corvair powered 601XL from legendary DAR Johnny Murphy, in our old Edgewater hangar in 2006. Today, Phil still flies and enjoys it, but is also well at work on Panther Production kit #1, which will be powered by a 3,000cc Corvair. We awarded Phil The Cherry Grove Trophy for 2013, as Corvair aviator of the year. If you would like to read a story about and see the film on a running 3,000cc Corvair for a Sonex built at a College, Click on this link: Corvair College #27 run on film. 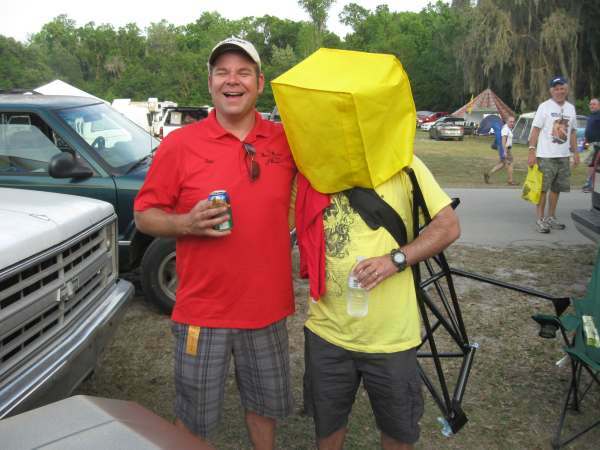 It is the engine of Amit Ganjoo, who is also the builder with the yellow bag over his head in the photo at the beginning of this story. Dan and Rachel’s website will be the primary source of performance data for Panther and Cleanex builders. Our website have a continuous flow of discussion on Corvair operations for all types of airframes. If you would like to read a story about detailed flight data collection on a 2,850cc 750, check out this link: CHT part #5, flight data from Zenith 750 . It is an example of the type of information exchanged between our builders. If you are drawn to aviator’s groups made of intelligent thinking people, you will fit right in with Corvair builders. procedures on Corvairs, 2,000 words of experience. Our .net website has more than 375 different stories on it, about 225 of them are purely technical posts with expanded operational information and experience. I have long stated that I can teach a 12 year old how to assemble an engine, but what we are really trying to share with people is a knowledge base that will effectively allow them to master the engine and use it with good judgment, something a 12 year old (and some adults) cannot do. If some of the articles that I write don’t initially sound like a set of instructions, consider for a moment that the message of the artice may be about the critical element of Judgment. Let me be absolutely clear, that I will be polite to people, but I will not work on, offer advice on, or help with products made by bankrupt people that I considered vermin. Nor will I allow these people to attend any of the Colleges. This isn’t out of spite, it is to protect these builders lives. They all want to put a band aid on their bad purchase and make it “good enough to fly.” A band aid isn’t going to do it, an amputation is in order. People who blew $12K on junk don’t want to hear this, they are still looking for a cheap out that doesn’t exist. I will not assist them in the delusion that they have found one. On line discussion groups and websites have a small number of old posts from people who bought trash like this for their projects. If you look closely, these people offered great testimonials, but later abandoned their builds. Look at the dates on many of these posts and then compare them to FAA aircraft registrations on Landings.com. From looking at our sites you can see photos of dozens and dozens real builders with real names and flying planes. I encourage builders to do their home work; our track record will speak for itself. -ww.